Dynamic performance where the sky's the limit - the new Audi RS5 Cabriolet entices with a scintillating combination of power and elegance. The four-seat convertible, which is built in Neckarsulm by quattro GmbH, combines its distinctly sporty character with the exhilaration of open-top driving. 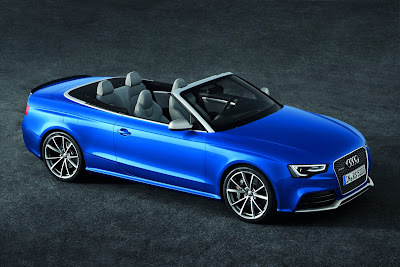 The high-revving V8 FSI develops 331 kW (450 hp) from its 4.2 liters of displacement, accelerating the Audi RS5 Cabriolet from zero to 100 km/h (62.14 mph) in 4.9 seconds. The seven-speed S tronic and the quattro permanent all-wheel drive system reliably transmit power to the road. The chassis also boasts a wide array of high-tech solutions, ranging from carbon fiber brake discs to the sport suspension plus with Dynamic Ride Control (DRC). Sophisticated assistance and infotainment systems round out the offering. The 4.2-liter FSI delivers 430 Nm (317.15 lb-ft) of torque to the crankshaft between 4,000 and 6,000 rpm. It produces 331 kW (450 hp) at 8,250 rpm. The long-stroke naturally aspirated engine develops 79.5 kW (108.1 hp) per liter displacement and special flaps in the exhaust tailpipe vary the sound. The convertible accelerates from a standstill to 100 km/h (62.14 mph) in 4.9 seconds - the best in its class. As an option, Audi can increase the top speed from 250 (155.34 mph) to 280 km/h (173.98 mph). The combined fuel consumption of the powerful V8 is 10.7 liters per 100 km (21.98 US mpg). Thanks to the long ratio of its highest gear, the seven-speed S tronic makes a substantial contribution to efficiency. Drivers can employ the automatic dual-clutch transmission for instantaneous and smooth shifts in the D and S programs, or they can shift manually using the paddles on the steering wheel. In its latest evolutionary stage, the quattro permanent all-wheel drive system features the self-locking crown-gear center differential and torque vectoring. Audi also offers the optional sport differential for the rear axle, which actively distributes power between the wheels. Aluminum is used for much of the five-link front suspension and the self-tracking trapezoidal-link rear suspension on the Audi RS5 Cabriolet. The speed-dependent power steering system is highly efficient with its electromechanical drive unit. The body is built 20 mm (0.79 in) lower to the groundthan on the Audi A5 Cabriolet, the axle mounts are stiffer, the anti-roll bars are larger and stronger. Aluminum forged wheels, size 9 J x 19 with 265/35 tires, come as standard, and Audi offers optional 20-inch wheels as well. Internally ventilated, perforated discs in a weight-saving wave design (3 kg) (6.61 lb) lower in weight) bring the car to a stop; pins are used to join the discs to the aluminum brake pots - a concept adopted from motorsport. The front brake callipers operate with eight pistons each; Audi can deliver the car with fiber-reinforced ceramic discs as an option. The ESC stabilization system with Sport mode can be fully deactivated, if the driver prefers. 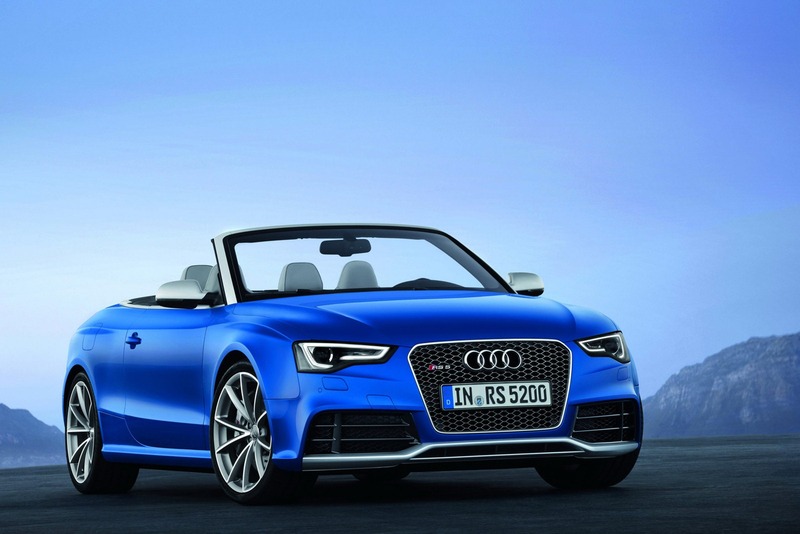 Audi drive select is a standard feature in the RS5 Cabriolet. The driver can use this function to vary the characteristics of main technology components. These include the throttle valves, the seven-speed S tronic, the steering and the exhaust system sound flaps as well as the optional components: sport differential, dynamic steering, adaptive cruise control and the sport suspension plus with Dynamic Ride Control (DRC). The latter entails a hydromechanical system that operates without any delays; the shock absorber characteristic can be adjusted over three different maps. 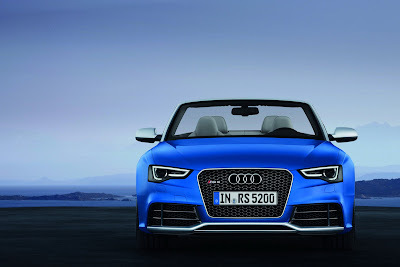 The Audi RS5 Cabriolet provides an accomplished combination of Audi's design idiom and the fascination of a four-seat convertible. The high-performance convertible is 4,649 mm (183.03 in) long and 1,860 mm (73.23 in) wide, but just 1,380 mm (54.33 in) in height. The long hood, a wheelbase of 2,751 mm (108.31 in) and clean lines create a flowing silhouette with finely balanced proportions and striking details. The tapered Singleframe grille dominates the front end, its side edges extending beyond the hood. A frame in a matt aluminum look encloses the grille, the honeycomb grille insert that sports an RS5 logo shines in anthracite. The wedge-shaped headlights with wave-like lower edges draw the eye to the vehicle's exterior, creating the visual sensation of more width. The xenon plus lamps inside the headlights surround the LED strips that form the daytime running lights. The large side air intakes combine with the flat central intake under the grille to accentuate the width of the front end. The two exterior intakes sport honeycomb grilles and are divided up by vertical and horizontal struts into six segments in each direction. They are integrated into a boldly contoured bumper that tapers into a powerful aluminum-look splitter edge. An anodized aluminum strip on the windshield frame, a classic feature of all Audi convertibles, lends the vehicle a stylish touch. The decorative trim strips on the window channels and the soft top box cover are made of the same material, and the door mirror housings are finished in a matt aluminum look. Crisp, taut surfaces and sharp contour edges characterize the side lines - the dynamic line runs over the side sills, the sweeping tornado line below the windows. 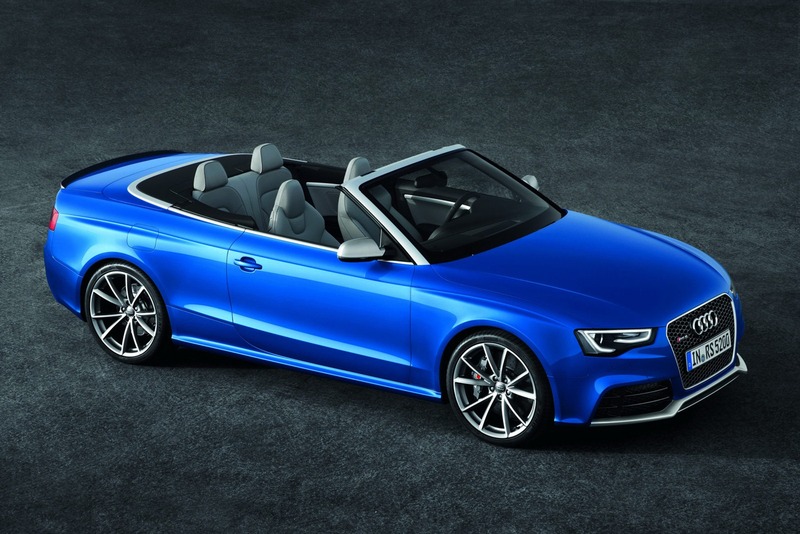 The wide shoulders, the powerfully flared wheel arches, the large wheels and the angular sill trims are testimony to the raw power of the Audi RS5 Cabriolet. The lines also emphasize the impression of sporty width at the rear. The luggage compartment cover sports an RS5 logo and a subtle spoiler lip made out of matt carbon; the lip can also be painted in the body color as an option. The two large, elliptical tailpipe tips of the dual exhaust system enclose the diffuser, which extends far upward. A contour painted in the body color (available optionally in aluminum look) splits the diffusor into two sections, with the upper section featuring a honeycomb insert. The Audi RS5 Cabriolet is available in eight exterior paint finishes - the Ibis White non-metallic finish, the metallic Suzuka Grey, the pearl effect variants Daytona Grey, Misano Red and Phantom Black along with the specially pigmented crystal effect finishes Panther Black, Estoril Blue and Prism Silver. In addition, a virtually unlimited range of customized paint finishes is available exclusively from Audi. The soft top is available in black, gray, red or brown. As options, Audi can install a styling package in matt aluminum as well as an engine compartment design package with carbon trim. The interior entices with its high-quality workmanship. User controls are intuitively simple - one of Audi's classic strengths. All the buttons, switches, and levers are exactly where the driver expects them to be. Trimmed in perforated leather, the multifunction sports steering wheel comes with a strong, flat-bottomed rim. The shift paddles come with an aluminum-look finish. The driver information system displays on request a RS-specific menu including lap timer and an oil temperature gauge. Just like the MMI monitor, the system displays an RS welcome page as the vehicle is started. The speedometer and rev counter have black scales, white dials and red needles. The standard S front sports seats come with high bolsters, a removable seat cushion, four-way lumbar support, integrated head restraints, heating, and power adjustment. RS5 logos are embossed in the backrests. Seat covers come in a combination of black leather and Alcantara, black or moon silver fine Nappa leather with piped seams in rock grey are available as an option. All grades of leather are pigmented to inhibit heating by sunlight. As an alternative to sports seats, Audi can also fit bucket seats for luxurious climate-controlled comfort seats with ventilation function. The Audi exclusive range includes exquisite leather packages, including bucket seats covered in diamond-quilted fine Nappa leather. The interior of the Audi RS5 Cabriolet is finished in black; as an option Audi can also supply the soft top headlining in star silver. Carbon inlays are standard in the interior, but alternative inlays are also available optionally at no extra charge in matt brushed aluminum or Aluminum Race with its three-dimensional effect, black piano finish or light stainless steel mesh. The Audi exclusive range includes a selection of wood veneers as well as many other individualization options. The surrounds on the instrument cluster and the centre console dazzle with their piano finish look; the selector lever knob on the seven-speed S tronic features RS-specific styling. The door openers taper to double, narrow bars - another hallmark RS detail. The pedals, the footrest, the air vent frames, the MMI buttons and many other controls shine with their aluminum-look finish, aluminum inserts adorn the door sill trims. RS5 logos add striking touches in the interior. The backrests of the two-seater rear seat bench have sporty contours and are symmetrically split. They can be unlocked by actuating levers in the trunk and drop automatically onto the seat cushions thanks to pre-tensioned springs. The large standard pass-through provides a total loading length of 1.76 meters (5.77 ft) and 750 liters (26.49 cubic ft) of stowage space. Audi offers a ski/snowboard bag as an option. 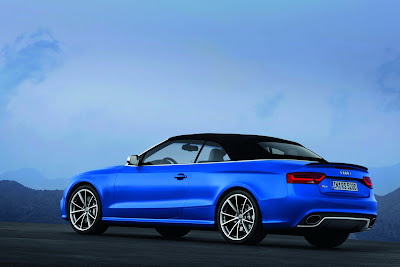 The Audi RS5 Cabriolet will go on sale to customers in Germany in early 2013, with a base price of 88,500 euros. The standard equipment is wide-ranging - apart from the features already mentioned, the lineup includes parking system plus, automatic belt feeders, an electromechanical parking brake, automatic climate control, wind deflector, concert radio with CD player and eight loudspeakers, a lighting package, and a restraint system package that includes six airbags, integral Audi head restraint system, and ISOFIX anchor points for child safety seats in the rear. Customers looking for even more comfort will find what they are looking for in the Options items. The range includes the convenience key, the high-beam assist, adaptive light, head-level heating, rear seat heating, memory function for the driver's seat and deluxe automatic air conditioning with three-zone control. 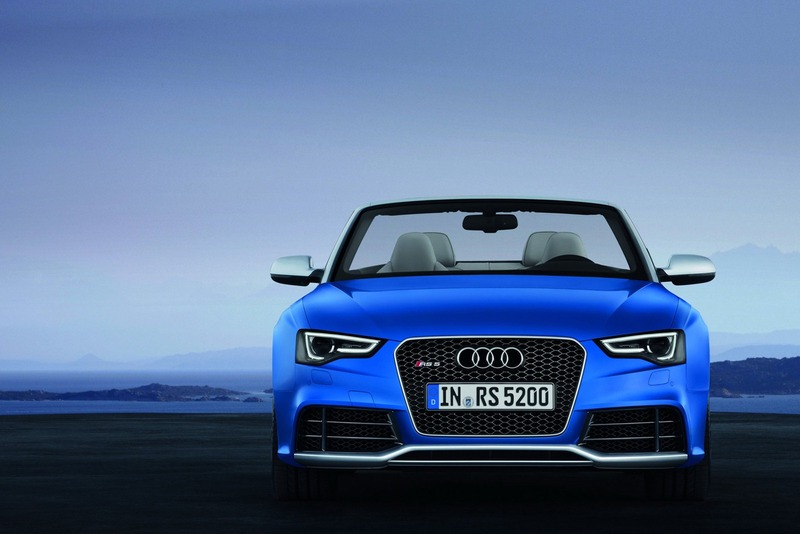 All of the assistance systems from the A5 series are available in the new Audi RS5 Cabriolet. The driver information system with rest recommendation function is standard; it detects when the driver is getting tired. Adaptive cruise control maintains the four-seat convertible at the required speed and at a constant distance to the vehicle ahead; at speeds below 30 km/h (18.64 mph) it can trigger emergency braking should the need arise. Audi side assist makes changing lanes safer, Audi active lane assist uses slight steering interventions in the electromechanical power steering to help the driver to stay in the driving lane, and the parking system plus with reversing camera facilitates maneuvering. The system lineup is just as extensive when it comes to infotainment. The top-of-the-line version is the MMI navigation plus - a high-end media control center with large hard drive, DVD player and seven-inch color monitor with 3-D graphics. The Bang & Olufsen Sound System controls 12 loudspeakers with an output of 505 watts. 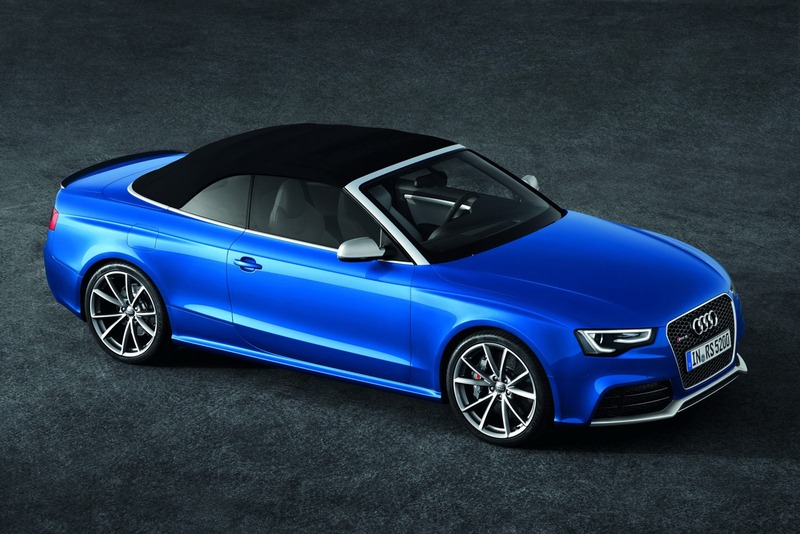 The Bluetooth car phone online provides the perfect complement to MMI navigation plus - it connects the Audi RS5 Cabriolet to the Internet via a UMTS module. Passengers can use their mobile devices to seamlessly access the web via the integrated WLAN hotspot. For the driver, the system delivers customized online services from Audi connect to the car - they range from Audi online traffic information to navigation with images from Google Earth and Google Maps Street View and Audi music stream web radio.